Last Updated: 2/7/19 | Reviewed By: Adam H. Rosenblum Esq. On November 1, 2016, the New York Move Over Law was expanded. It now requires drivers to slow down and move over for police and emergency vehicles (including ambulance workers and firefighters), hazard vehicles like tow trucks that display amber lights, roadway construction crews, roadway maintenance crews, and, most recently, sanitation vehicles. NYS VTL 1144-a (a) should not be confused with VTL 1144 (a) – Failure to yield to an emergency vehicle, which drivers can read more about here. What Are the Penalties for NY’s Move Over Law? Fines: A conviction for violating VTL 1144-a (a), New York’s Move Over Law, can result in a fine of up to $150 for a first offense. A second offense within 18 months of the first means a fine of up to $300. A third offense within 18 months means a fine of up to $450. Points: New York’s Move Over Law is a 2-point offense. Surcharges: Like most moving violations in NY, drivers are obligated to pay a state surcharge of $88 or $93 upon conviction for New York’s Move Over Law. Driver Responsibility Assessment (DRA) fee: Receiving 6 points within 18 months requires drivers to pay an additional fine called the Driver Responsibility Assessment (DRA). This is separate from the fine and is paid directly to the DMV. A DRA costs $300 for the first six points. Each additional point adds another $75. Auto insurance increase: NY’s Move Over Law is a moving violation and can have an impact on one’s insurance premiums. Studies have shown that a conviction for a moving violation can result in a hike in rates of up to 20%, sometimes more. What is New York’s Move Over Law – VTL 1144-a (a)? Every state in the nation (except D.C.) has a variation of the Move Over Law. In NY, the offense is formally called “failing to move over for emergency vehicles and hazard vehicles” and is codified in VTL 1144-a (a). There are a couple of solid defenses that a skilled attorney can use to help a driver get out of a Move Over Law ticket. First, NY law prohibits a driver from moving over or changing lanes unless he or she first finds it safe to do so. Consequently, a driver’s first line of defense against a move over law ticket is to cite NY VTL 1128, which expresses this idea, and to explain how and why moving over would have been unsafe. Remember, the wording of the unsafe lane change law (VTL 1128) reveals that the burden is on the driver to determine whether it would be safe to change lanes or not. In other words, this is not an objective standard that can be evaluated by the officer looking to what an objectively reasonable and prudent person would have done. This subjectivity gives a driver the upper hand and makes it harder for a prosecutor to say it would have been reasonable to move over. Additionally, if it would have been safe for the driver to move over, but he/she simply did not have enough time to do so, this can be raised as a defense against a move over law ticket. This again requires an attorney to cite and explain NY VTL 1128. Ultimately, these two statutes, NY VTL 1128 and NY VTL 1110, can be one’s strongest arguments against a NY move over law ticket. In the 2013 case Despian v. Garcia, the Supreme Court of New York heard a case involving a Honda minivan and two police cars that were involved in a collision. The driver of the Honda minivan struck one of the patrol cars, which caused the patrol car to spin out of control and collide with a nearby unmarked police vehicle. Although the court was mostly dealing with a civil case of negligence, the court in dicta brought forth an interesting piece of information concerning the NY Move Over Law. Toward the end of the opinion, and after quoting the Move Over Law in full, the court explained that the driver “has not submitted any evidence that he took any of the actions required by section 1144, when he admittedly heard the siren and saw the lights of the approaching emergency vehicle.” Despian v. Garcia, 2013 NY Slip Op 30520 – NY: Supreme Court 2013. Afterward, the court ruled that the driver’s failure to bring forth this evidence showed that he could have been negligent in his actions. For a NY driver this is important. According to this case, those who fail to obey the Move Over Law can be found negligent. After all, failing to adhere to a traffic law could be grounds for the breach of a duty owed to other drivers. Presuming the driver caused damage or an injury to another person, he/she very well—like the driver in Despian—might be negligent. What does this mean for most NY drivers? Be careful! For those who get a ticket for violating the VTL 1144, it is absolutely vital to: 1) provide concrete evidence of how one, in actuality, complied with the statute (i.e. you did move over at the right time) or 2) provide a good defense for why it would have been dangerous or even unlawful to move over. Despian is a clarion call for all NY drivers. It not only warns that violating the Move Over law can be enough to keep a negligence lawsuit alive, but also that traffic ticket violations can be used against in a different legal arena entirely: civil negligence cases. Does the Move Over Law apply just to police? No. The statute covers any authorized emergency vehicle with one or more blue lights or a combination or red, blue, or white lights, as well as maintenance vehicles with amber lights. What vehicles do you have to move over for under VTL 1144-a(a)? Do I have to move over if the vehicle does not have its emergency lights on? While the statute states that a vehicle must be “displaying” its lights, it is a good habit to safely slow down and consider moving over any time there is a vehicle—even a non-emergency vehicle—on the side of the road. 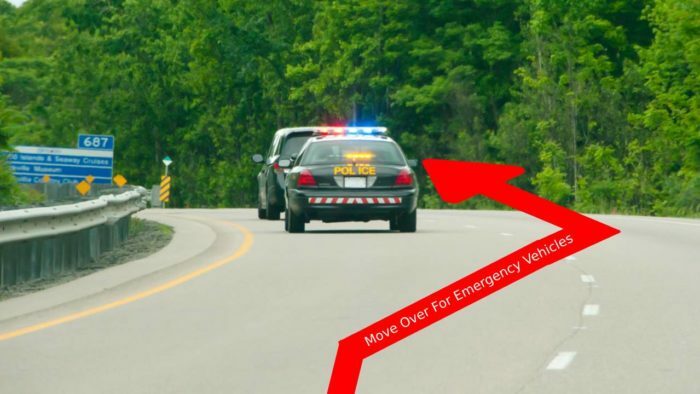 Is the Move Over Law the same as failing to yield to emergency vehicle? No. Failing to yield to an emergency vehicle (VTL 1144-a) is different. This applies when drivers do not give the right of way to a police, ambulance, or fire department vehicle that is approaching with its lights and/or siren on. The fine for this offense is higher ($275) and carries more points (3). The Move Over Law is a subdivision of statute 1144-a with its own distinct parameters and penalties. I was driving at the speed limit of 65 MPH Southbound in the right-hand lane on the New York State Thruway at approximately 5 PM on a Sunday afternoon. As I rounded a corner, I saw several vehicles parked in the right shoulder (car, flatbed wrecker, and at the far South end of the vehicle group, a NY State Police car with lights flashing). Knowing the law to move over, I immediately activated my left turn signal and looked in my side mirror and over my left shoulder to see if it was safe to shift lanes. There was a continuous stream of traffic in the middle lane going much faster than I was, so there was no safe way of shifting lanes. I moved to the left edge of the right lane, but could go no further because of the traffic. I passed the Police vehicle while still in the right lane. Shortly thereafter, he pulled me over and issued a ticket citing 1144-AA. I am a New Jersey driver; the last time I got a traffic ticket was at least 20 years ago. Hello Eliot, and thank you for your question. We generally suggest contesting tickets such as yours, as a guilty plea / verdict will result in the assessment of points, fines, and a likely increase in your insurance rates. I was driving on I-86 Wesbound, I saw a flashing lights where a car was pulled over. On the opposite side of the barrier was another police car. Feeling uncertain as to what to do, I stayed in my lane because a) I didn’t know what the police car on the other side of the road was going to do, and b) I did not have time to look in my review mirror to go the left hand lane. I was driving slowly but with cars around did not find it safe to veer to my left hand lane. I live Closter, NJ, far away from Elmira where the court date is set. Glen – Please advise us of the specific violation code you have been charged with. These violations can be charged as either 2 or 3 point tickets. Since you are a NJ driver, 2 points will transfer for either of these violations. Additionally, these tickets may have an impact on your insurance rates. I was traveling on I-86 in the right lane and I saw a police officer had pulled someone over in the right shoulder. His lights were on and I proceeded to move to the left lane but the left lane was snow covered and my car nearly slipped out of my control while crossing over the dotted line so I moved back to the right lane… the officer then pulled me over for not moving over. Do I have a chance here? Nick – There is an argument to present in this case to justify your inability to move over as required by the statute. I live in NYC and don’t even own a car but I rented one to take my son and his two friends to a karate tournament upstate. On the way back I saw the police car issuing another driver a ticket on the shoulder so I slowed down to well below 60 as I passed. There wasn’t even a chance to pull into the fast lane because everyone in it was going, well, fast. I don’t live in upstate New York and have never heard of this law and there were no signs posted, except at rest stops. There isn’t even an address to send a check to if I just wanted to pay it and be done. Can I fight this without having to rent another car and driving to who-knows-where upstate? Zuri – Hiring an attorney will allow you to contest this violation without personally appearing in court. I received a ticket yesterday ( Oct. 7th. ) for not slowing down enough for a police car which was pulled off to the right. I saw the car but had no space to my left with which to move over. I was traveling 60 MPH in a 65 MPH zone and did slow down but according to the officer I needed to slow down to 45 MPH. He acknowledged that there was no room to move over to the left. I have a clean record and the last thing I want to do is put anyone in danger but I don’t see what I could have done. Dennis – The ‘move over’ violations are increasingly common tickets that we see. Unlike speeding violations, these tickets are frequently subjective in nature. We generally recomend contesting them, as they often lead to impacts to insurance rates. I received a ticket today on Route 84 for not pulling over. Clearly like all most of your other comments, I did not know this law. I was not speeding I was with my wife and I was picking up my son at college. You have any recommendations as to how I should plead? I I’m not working now and cannot afford a rate increase and now that I know the law I will never do this again. Would love to hear from you. Frank – we suggest contesting this ticket to avoid the 2 or 3 points that will be assessed depending on how this violation was specifically charged. Additionally, contesting this violation will allow you an opportunity to avoid the insurance implications that would potentially arise from this ticket. A tow truck pulled over in front of a stalled car, no lights on. He was about to set up tow. He opened his door and hit my mirror. Officer came and issued me with failure to move over. He stopped with wheel on white line and did pull over more to the side. This was a two lane route 9 road at night with oncoming traffic. No damage to his door but my shattered side mirror. I have pics showing his door opened 3 or 4 feet into the road. Kir – how exactly can we help you contest this 2 / 3 point ticket. In order to provide more specific inforation, I need to know which court has jurisdiction over your ticket. I received a ticked for failure to move over coming upon 2 troopers on the side of the road with their lights flashing. The trooper said there was no traffic behind me for 1/2 mile. He neglected to see the car directly beside me in the other lane prohibiting me to move over. It was during rush hour traffic on a very busy I-390 . What should I do. The officer told me to plead down,not to plead guilty. Patricia – we generally would recommend contesting such a violation, in order to avoid the points and insurance implications. I was driving on a highway in Yonkers, NY today and did not know about the Move Over Law, so I passed a county police car with lights activated without changing the lane to the left (It would have been safe to change the lane, if I would have known the law). I got a ticket, but the police officer recommended me to plea for not guilty since I did not know the law. 1) Should I plea for not guilty ? Is there any chance that this may be dismissed since I did not know the law ? 2) On the front page, it says that I would have to return the ticket by September, before the scheduled appearance date, but on the Section B (Plea of Not Guilty), it says that I would have to respond within 48 hours. So do I have to mail back for Plea of Not Guilty within 48 hours ? 3) What happens if I get asked to appear in a court while I am on my vacation ? Is there any way to change the court appearance date if I am on vacation on the assigned date ? 1.Not knowing about the law is not a defense. What the officer advised you was incorrect. 2.You must reply to the ticket by the ‘return by’ date, which would be later than 48 hours. 3. You may generally obtain adjournments of a court hearing date for such a situation. I drove past a police officer who had pulled someone over to the right and on route 17 and had his lights flashing and i didn’t move over to the left lane, and a minute later the same officer came behind me, pulled me over and ticketed me for not moving to the left. what might i get in court for this offence and is it worth fighting? Chaim – depending on how it was charged, you are facing either a 2 or 3 point ticket. Due to the nature of ‘move over law’ violations, they are generally viewed harshly by both the officers, and the courts. Thus – while we generally believe these tickets are worth contesting, plea offers are frequently not provided in these cases. I was driving on NY State Hwy 17 in Sullivan County yesterday when I passed a police vehicle who was in the breakdown lane. I was in the right lane driving the speed limit when I was pulled over by the officer and given a Move Over citation. The officer stated that there would be no points against my Connecticut license. I plan on pleading Not Guilty but will they make me appear in court? I live 3 hours away. An appearance will be required by you (or your legal counsel) if this matter goes to trial. Unfortunately, prosecutor’s will frequently decline from presenting any offer. 1144-A. On the I 290. There I had just passed a police vehicle stopped between the two sections of the highway facing my side of the road (ie left hand side of the road facing perpendicular to the road) I had moved over and was going the speed limit, almost immediately after that there was a second police car on the right side of the highway adjacent to the right lane. Not leaving much time to change lanes yet again. Neither had any emergency lights activated at the time I passed. The second car stopped me for the above infraction. If I plead not guilty with the above explanation what can I expect. I live in Canada so going back to go to court is not an option. It may be possible to contest this 2 / 3 point violation without your personal appearance. I should note that these violations often do not allow for plea bargaining due to the nature of the offense. I would be happy to provide a free consultation. You may reach me at 888-883-5529. I was pulled over for the The Move Over Law in December. I lost the ticket and missed the deadline to plea and now my license is suspended. Is it worth it to hire an attorney for this or am beyond any chance of negotiating anyway? Note: The reason I did not move out of the right lane was because there people SPEEDING in the left lane and I didn’t want to risk it. Whether you will be able to negotiate this ticket will depend on the jurisdiction. Certain court’s will not provide for any negotiation for these offenses. If you would like to discuss in further detail, please feel free to contact us at 888-883-5529. Today I and 2 other vehicles in front of me got “move over” tickets by the state trooper on I 87. The reason why I did not change the lane was that distance was too short and I did not have enough time to do so. There was a moving truck in front of me and I had limited view of the road(it is mentioned on the ticket that truck was in front of me). I was focused on the car that was slowing down in front of me, and did not have enough time to determine safety of changing lanes. When I saw police vehicle I did slow down to 52 mph(65mph speed limit). My issue here is that I live far away from that town and I can not show up on the court. My question is: if I plea guilty with explanation, will it make any difference or I should just send a check? You have the right to plead guilty or not guilty. The explanation will not be needed when submitting your guilty plea. Keep in mind any moving violation does impose points to your driving record and can have the potential to affect your car insurance once the conviction is placed on your driving record. I just received a Move Over Law violation yesterday. I received the ticket in NY and I live in MI. The reason I was in the rightmost lane next to the shoulder that the police officer was with his lights on was that I needed to exit the highway and I was in the offramp lane. It’s not worth it for me to drive the 12 hours round trip for a court appointment, so I was planning to just pay the ticket. Tor – hiring an attorney will allow you to contest this 2 / 3 point ticket without your personal appearance. I just got a ticket for failing to move over on The Taconic State Parkway near Stanford. The police vehicle was on the right side of the road in back of another vehicle I thought he was ticketing. I did slow down and moved to the left but being unaware of the law I did not think I needed to move to an adjacent lane. Does it make sense to contest ticket in the hopes of at least getting a reduction in the points or the fine reduced? Robert – courts are generally unwilling to provide plea reductions for these types of violations, as they directly impact the safety of the officer. You may, however, contest this matter in trial. Please note, not being aware of the law is not a defense here. I got a ticket on I 84 in Dutchess county for failure to move left. I pleaded not guilty and asked fro a deposition, the officer never returned one. Will I be able to get this dismissed?. We need more information in order to be able to accurately answer that question. Jeremy – where are you currently licensed to drive? This is a 2 or 3 point violation – depending on how the officer listed the charge against you. Aside from points and fines, this may have insurance implications. I got a 1144-AA ticket on 10/22/2017 on the portion of NY17 under jurisdiction of Owego Town Court (Tioga County). Literally one minute prior to that ticket, I was stopped for a speeding ticket, after which I rejoined the traffic from the shoulder a quarter mile upstream. I was still in the rightmost lane, when I noticed the state trooper car with lights flashing and the trooper standing by the stopped car talking to the driver. I wanted to move to the left lane but there was a much faster car in it close behind, so I felt it was unsafe to perform the maneuver and stayed in my lane, then slowed down as much as I could while passing the parked cars. A minute later, I was stopped. The trouper told me he had not seen me but he could ‘feel’ me passing behind. Do I have any chance contesting this ticket? While you do have a ‘chance’ of obtaining a dismissal in this case, many courts do not allow for plea bargaining of move-over tickets. Hi, I got a VTL 1144-a ticket. There was a police emergency car with flashing lights on attending something else close to a Burger king entrance. Initially I was going to the Burger King through that entrance, but I realized the police car was blocking it so I decided to use a further entrance ahead. For that I drove around the stopped police car passing next to it while looking to the traffic on the other side which was really busy. Suddenly I hear a noise and realize that the police officer had opened his door because he had not seen me and my car does some small damage on his door. He was very upset but in my head I know it was his fault for not seeing me, it even scratch only the back part of the side of my car as I had almost already driven past him. The officer’s supervisor didn’t seem to want to charge me with anything, just run as an accident, but in the end the first officer gave a “move over” ticket. I understand that by law I should have give more space, but can I claim that the only reason I didn’t do that was because I was concerned with the safety regarding the traffic on the other side? Or should I forget it and simply plea guilty and pay the fine? Gus – Move over violations are complicated cases because they are a) highly fact sensitive, and b) unlikely to receive a plea offer in many jurisdictions. Whether you choose to fight this will often depend on the location of the incident, your driving history, and where you are licensed to drive. If you would like to discuss these points with us, you may reach us at 888-883-5529. I got a traffic ticket for failure to move over emergency vehicle. It was early morning around 7-8am and I drove my friend to Albany International Airport through Albany shaker road. When I made a turn and tried to leave airport, there was a parked police and the light was on, no siren. I did see the light but didn’t realize that I need to move over and yield the lane. I am an international student, having driven in NY for a year. I don’t want my insurance to increase. What can I do to avoid getting points? Wei-Ting — Whether this violation will impact your rates will depend on your prior driving record, along with your insurance company’s policy. You may contest these violations in court. Please note, however, that many jurisdictions have a policy against offering any form of plea reduction for this violation. I got a notice from traffic police for move over. I was driving from niagara to New Jersey. On the way a polic stopped me for the move over. The police car was in emergency lane and I am was in the right lane. I am not aware of the rule so I haven’t moved to left lane, I was in the right lane itself but in normal speed. What can I do to avoid getting points. In order to properly assist you, please advise us of the court that is handling your case. Generally speaking, these violations are either 2 or 3 points, depending on the offense charged. Simply the cop had someone else pulled over at the beginning of an exit ramp. And then subsequently pulled me over saying that he thought i would hit him. Is there any defense being that he was on the exit ramp? 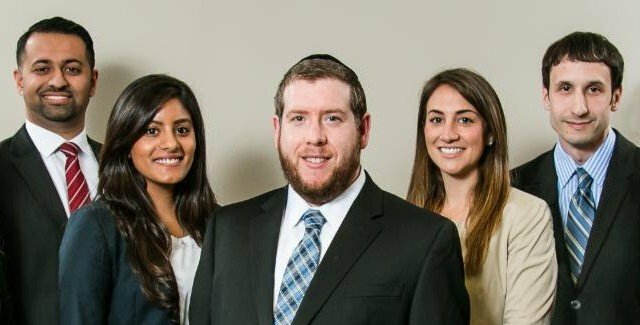 Yaakov – It appears that you are currently being charged with a ‘move over’ violation. Where did this incident occur – as the location of the ticket has significant procedural implications. A State Trooper was giving someone a ticket on I-86 and I moved over hundreds of feet in advance before passing them however a car similar to mine did not. Several miles down the road the officer caught up to me and pulled me over thinking I was the car that did not move over and gave me a citation. I tried to explain but she was angry and didn’t give me barely any chance to talk. I want to plead not guilty on the form and send it back but I’m afraid I will not be believed and then have to go to court. What do I do? I feel violated and want justice to be upheld here. While you may contest this ticket, these violations are inherently difficult. Many courts do not plea bargain these matters to parking tickets. Additionally, officers are likely to recount (albiet incorrectly), the events that transpired. You may contact us at 888-883-5529 for a free consultation. I will be happy to provide you informateion more specifiic to your case. My son was driving in NY (we are from PA) he was on vacation with his girlfriend. We are not familiar with this law in PA. We typically don’t slow to 20 mph and get in the other lane. We may “go around the office and if anyone else is pulled over. Ambulances or approaching emergency vehicles we ALWAYS pull over. My question is my son did slow passing the officer but did not feel safe taking his eyes off the officer to change lanes and was not able to determine the safety in changing lanes with any approaching vehicles coming up his left (he was on a highway). Given if he pleads guilty how much is the fine and how does this affect his license and our insurance in PA? Thank you so much for guidance! Wendy – If your son received a violation of Vehicle and Traffic Law 1144(a), he is facing 3 points. If he was issued a ticket under code 1144(a)(a), he is looking at 2 points. This ticket carries a standard fine of $150 plus a $93 administrative fee is he pleads guilty. The violation would then transfer to Pennsylvania, as both states are part of an agreement to share information about traffic tickets. As a result, your insurance may increase. Hey, I got a VTL 1144-AA when I was traveling from NY to Virginia. I pleaded guilty to the ticket and I just got a mail from the Milford court asking for a fine of 243$. The ticket was on my foreign driving license (country outside of US) and I was driving a rental car. The letter says that failure to pay the amount will lead to suspension of my license. Does non payment of this fine lead to any serious trouble for me? I don’t have a US state license as of now and am planning to get a US State license next month. I suggest you pay this fine to avoid any issues with your license in the future. I turned left onto Edgewood Ave. in St. James, NY and was heading south to pick up my grandson at the Middle School located on Edgewood. Edgewood Ave is a two lane road, one lane going south the other, north. There are NO shoulders on either side of the road. Traffic was moving slowly as everyone was picking up their kids from school and there we lots of school busses on the road. I looked in my rear view mirror and the vehicle behind me had just turned on his flashing lights. I wasn’t sure what to do so I decided to slowly move down the road until I saw a spot with enough grass to pull off the road. The police officer then put on his siren and sped around me….went about 1000 feet to a stopped vehicle at the entrance of the school parking lot. The vehicle appeared to be waiting for the officer and was apparently getting a ticket from him. As I approached the Entrance of the school, the police officer stopped me, proceeded to yell at me for not yielding to an emergency vehicle, and told me to pull into the school entrance. He now had me and the other car in the entrance driveway and proceeded to give the other car a ticket (have no clue what that guy did) and then gave me a ticket too. At that point I had two thirteen year old’s in the back seat. I am 74 years old and he scared the heck out of me with his nastiness. Michelle – if you are interested in contesting this 2 / 3 point violation, please contact us at 888-883-5529. I received a ticket for violating 1144-a. The officer had lights on and no car was pulled over. There was no vehicles in other lane. The officer was inside his vehicle. I did slow down in the 65mile/hr zone to 45m/hr. It was a curved in the highway, I didn’t notice him so I only slow down. He pulled me over after that, his second question he asked ” do you have weapons or drugs in the car ? “. This was on 07/29/2016. I went to court date, but I was told, that I need to pay 500 and accept the points or go to trial. I am still waiting for my Trial date. This was on Sloatsburg village court. I have a NJ driver license. Nills – Are there any specific questions you have for us? I got pulled over on I90 heading to Turning Stone when I passed a trooper with lights on off on the side off on the side of the road but no one else pulled over. She pulled out after I passed and had not moved over. She let me go in the end with a improper plate violation when I told her, and explained I was following my family for a birthday celebration. I don’t know what the fine is. She said there will not be points, etc but warned me about the move over. Do they have to have a vehicle pulled over or was I still suppose to move over? Should I plead guilty and just say thank you? Riley – For future reference, you should have moved over if it was safe to do so. Without knowing more facts about your case, I can not answer that question. I received a citation for “failing to move over for emergency vehicles and hazard vehicles” and is codified in VTL 1144-a. Am I in the right to want to contest this ticket? I did use caution, especially given that I had my grandsons in the vehicle with me. Barb – This case will be decided based upon the subjective belief of the Judge. Please remember – the officer’s testimony may vary from the facts as you have described them. I just received a ticket for violating 1144-aa. I was going west on route I-90 close to the city of Albany. The officer had lights on on the shoulder of the road. I was driving a U-haul truck for the first time in my life and I could have technically switched over to the left lane but I was afraid to do so due to the lack of experience of maneuvering with a truck. Instead, I was able to reduce my speed to about 55 mph (again, could not reduce it further because I was driving a truck) but still was given this ticket. Should I contest it? Or plead guilty and write in comments what I wrote here? I suggest contesting this violation to avoid the points, penalties, and insurance implications. Writing an ‘explanation’ on the ticket itself will not assist you in avoiding these consequences. I received a ticket for “failure to take due care for emergency vehicle” – a police cruiser had pulled a car over on a 2 lane stretch of Route 90. A truck blocked me from moving over to the left lane and as I approached, the cruiser turned off the flashing lights and the car that was stopped began moving out. I passed both well below the speed limit and was ticketed about 2 minutes later. I am a licensed NJ driver. What’s my best alternative? I have not had a moving violation in more than 10 years. Lonnie – what court will be handling this ticket, as the procedures to address such a violation vary. Generally speaking, 2 points would transfer to your NJ license if you are found guilty of this offense. I just received a ticket for violating 1144-aa. The officer had lights on and a car pulled over. There was no vehicles in other lane. The officer had returned to his vehicle but I did slow down anyway in the 65 mile an hour hghwy to about 55. This was on 84 e bound in wallkill, ny. Should I send in by mail as guilty or not? I was on a work assignment in my personal vehicle. I am also in a temporary handicapped status due to right foot fracture. I have a temp tag…just an fyi. Harold – I suggest you contest this ticket as it does carry points, and fines. Additionally, this ticket will likely impact your insurance rates. You may contact us for a free consultation at 888-883-5529. I got ticket 1144-AA for the move over law on 5th September 2016 . I was on my way to Niagra. I am from Connecticut and I have not seen this law being applied ever. On my way back I noticed multiple cases of police car on shoulder with another car but no car moved over . After my ticket I researched and found although this law is present for few years ,it has been implemented since march 2016 and its not that stringent either. There may be a few cases on this . PC – we would be happy to help you contest this ticket – but would like to discuss the potential consequences with you. You may reach us for a free consultation at 888-883-5529. This happened in New York flushing around 7pm. I know that i violated 1110A because I turned right on a street which i shouldn’t do between 7am – 9pm (Cop told me). As a new driver, i might made a mistake of missing out such sign that i can’t turn within a time. So i accepted this. So after i turned right, i kept driving as usual. And suddenly saw a cop behind me, of course i pulled over my car. But the cop ended up told me that he was already behind me for two blocks. I didn’t hear the sirens and didn’t see the lighting. A possible reason is because i have a music on (not too loud) and i was really focus just looking in the front driving. It was a bright sunny day as well. I suddenly got two tickets just because i turned right. Is there a way that i can possibly fight for 1144a “Fail to yield to Emergency Vehicle”? Because 1144a is actually “Failure to Yield Right of Way at Intersection” but i wasn’t even going into a intersection or anything, it was just straight in a very very crowded place (many cars, people and traffic). I haven’t gotten any tickets or point records in my license. but these two tickets can add up at least 5 points. I really want to do something for this. Because i didn’t mean to ignore cop and not pulled over or move over. It just happened that way, and the cop could’ve just warned me to pay more attention next time. I really want to know a good way to fight for 1144a for my instance. The fines are also extremely high for students. Thank you. The offense is called “failing to move over for emergency vehicles and hazard vehicles” and is codified in VTL 1144-a. What New York drivers really need to know is if you are in an adjacent lane, you too must move over. Failing to do this, even from an adjacent lane could result in a violation of VTL 1144-a. 1144a is considered a moving violation that is punishable by 3 points on your license and a fine of up to $275. The total fine for disobeying a traffic control device violation in New York is $235.00 and 2 points on your driving record. A total of 5 points on your driving record is likely to cause a substantial increase in your car insurance premiums. We have extensive trial experience at handling matters just like yours. Please feel free to call or email so we can discuss your options in more detail. I was in the same sort of situation. I always try to pull over in such situations but I got a ticket this May. When I saw the police lights I started looking in my left lane, but it was occupied and the driver was going the same speed as me. There were a lot of other cars in my lane and the passing lane. I was stopped and the policeman admitted that there was a car in my lane but he still gave me the ticket. I read the law and it said to change lanes if it was safe, which it was not. Joe – where did you receive this ticket? I received a vtl1144-aa in Oswego county. I’m from Illinois and was up at Fort Drum on a work assignment. Was heading back to Syracuse to fly to Chicago. Do you work cases in Parish, NY.? Yes, we handle traffic matters in Parish, New York. The ticket you received is called “failing to move over for emergency vehicles and hazard vehicles.” This offense is considered a moving violation that is punishable by 3 points on your license and a fine of up to $275. Once you retain an attorney you would not have to make any court appearances. Please feel free to contact one of our attorneys at the number below to discuss your options in more detail. Last night I was given a ticket for failing to move to the center lane. A police officer and another vehicle were moving on the shoulder of the road. The police officer stated I didn’t even slow up..possibly sped up. I did in order to let them merge after I passed. The law states I believe only if the emergency vehicles are stopped. They werent. Should I plead not guilty? I have a clean record. Hi Catherine, you are currently looking at a 3 point ticket with a maximum court fine of $275. Please contact us for a free consultation if you have any questions or concerns about having the ticket reduced. We could be reached at 888-883-5529. Hi Liaqat, you are currently looking at a 3 point ticket with a maximum fine of $275. If you would like to find out more information about having your ticket reduced to minimum penalties, please contact our office for a free consultation at 888-883-5529. I got ticket today for not moving over for an emergency vahicle …I got ticket in Florida, but my license from New York ….I want know how much fine & how many point I loss ? Hi Lucky, we are not licensed in Florida. We are not able to inform you about any penalties that you may receive in Florida. I got a ticket yesterday for not moving over for an emergency vehicle (police had another car pulled over). I didn’t change lanes because someone was coming up on my left. The officer put in the report “when told the reason for stop stated – you know, I thought of that. but there was a car coming up next tome and I didn’t want to cut him off. I didn’t see you in time”. I didn’t say “I didn’t see you in time”, I said “I didn’t think it was safe”. What would it cost to fight this ticket? Amanda – in order to give you a fee, we need more information about your case – specifically the name of the court that has jurisdiction. Hi I got pulled over at 2 am with one friend in my car we were coming down a hill and it looked as if the cars were waiting like normal until we got close so I moved over and Iater got pulled over for the move over ticket…but the cop didn’t have lights on so I couldn’t see that until I got close enough and got over should I get an attorney because he didn’t have his lights on? Sarina – I need more information to be able to help you – particularly the name of the court. I suggest you contact us so we may discuss the specific facts surrounding your ticket. I am a former President of a synagogue in Mt. Vernon, NY and an educator with the public schools for over 40 years. Yesterday I was driving to a meeting in Albany when I received a ticket for this ‘move over law.’ What happened is that the cop was on the right shoulder with another car he had pulled over. Jennifer – How can we help you with this 2 point ticket?